It’s probably wise to eschew numbers once you’re past three. It always makes me feel slightly nauseous when the working title of the next 007 outing is something along the lines of Bond21, as if he’s the last Bond to get on Twitter and can’t think up a decent user name. Mission Impossible 4, as well as stepping out of the safety net of the trilogy, also feels like a contradiction in terms. One impossible mission done, all well and good - but, after four, who’s rating these missions? 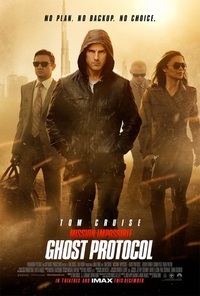 Yet, ‘Ghost Protocol’: is there a whiff of post-mortem here? Something deceased? The latest instalment features Tom Cruise once more as Ethan Hunt. Fanboy-made-good Simon Pegg also returns as a nerdy tech not a million light years from his turn as Scotty in the recent Star Trek (2009). And Brad Bird directs his first live action film after the wonders of The Incredibles (2004) and the fantastic and criminally under-seen Iron Giant (1999). His touch is readily perceived in the fantastic set pieces, which he keeps tightly paced and visually interesting. There is the Dubai tower scene that has been somewhat over-exposed in clips, trailers etc., as well as a chase in a desert storm and something in a multi-storey car park. The script is as smart as it can be and still allow for those set pieces, and all the actors are competent - with the exception of a dour-faced Michael Nyqvist, apparently cast purely to irritate Daniel Craig, and criminally underused as the criminal who is talked up a ‘mastermind’ / ‘world terrorist’ but does little of note and has about three lines. And then there’s Tom Cruise. It’s an oddity that this should be his franchise (despite rumors of a possible Top Gun 2), and there must be secret fears gnawing at his actorly soul. The whole point and spirit of Mission Impossible, from the original TV series to the first film, is that the mission itself is the main character. The members of the team are almost irrelevant - anonymous, grey suited clerks, g-men going about their business with robotic precision and unsmiling faces. It was not for nothing that Leonard Nimoy appeared in 49 episodes. Martin Landau and Peter Graves were by turns creepy and patrician, but never charismatic or likeable, and never ever properly speaking cool. They were men doing a job. Likewise, the one recognisable tagline that runs through the franchise is not "the name’s Hunt... Ethan Hunt" - in fact it isn’t spoken by Hunt at all, but usually by an anonymous voice: "Your mission, should you choose to accept it…"
In the first De Palma film (which is now unbelievably sixteen years old) this sense of virtual anonymity is kept intact. Hunt runs and jumps like the best of them, but Cruise’s star power is turned low, remaining entirely at the service of the film. He is a team leader but not, as he would increasingly become from John Woo’s follow-up on, a super agent with an earpiece. In this film his status as lone wolf is emphasized by his initial appearance in a Russian prison. The team he leads appears more cobbled together than anything. Working outside of the aegis of the secret services, they channel their inner Bourne. Cruise, unfortunately, is not ageing well and has the indignity of an obvious pretender, Jeremy Renner, biding his time none-too-patiently in the wings. Cruise’s face increasingly resembles the mask Jon Voigt wore in MI:1 just moments before he tore it off. Still, to prove the doubters wrong, he goes at it like an uncle in a disco, rappelling off skyscrapers and surviving explosions. Cleverly (and this feels like a Brad Bird touch), he always just misses, as if he’s lost his edge, rarely making a clean leap, constantly banging his head. It would be a neat conclusion to say the same thing of the film. It’s an intelligent and fun action film. It has some great moments and some missteps (cf. the villain and the preposterous back story). But, just as for every entry they keep coming up with freshly insipid ways to ruin Lalo Schifrin's amazing theme music, so here this variation on a theme is beginning to feel a little long in the tooth. This review was published on January 13, 2012.